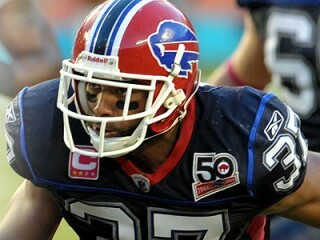 George Eugene Wilson, Jr. is an American football safety for the Buffalo Bills of the National Football League. Originally signed with the Detroit Lions as an undrafted rookie free agent on April 30, 2004… Signed to the Bills practice squad on 10/18/04 where he spent the remainder of the 2004 season. … Made the 53-man roster in 2005 … Spent the first 15 games on the Bills practice squad, promoted to the 53-man roster for final game of the season in 2006. … Spent the 2007 offseason working at safety...made the switch to safety and played 12 games in 2007. * at MIA (10/4) Made first start of the season and led the team with 2.0 sacks. First defensive back with a multi-sack game since Lawyer Milloy vs. St. Louis (11/21/04). Also posted his first forced fumble of his career on one of the sacks. Totaled five defensive tackles. Also led the team with three special teams tackles. * at NYJ (10/18) Had a very active day in the secondary with an interception (first of the season), six tackles, a tackle for loss, a pass defensed and a team-high three special teams tackles. * at CAR (10/25) Set a career-high and led Bills DBs with 10 tackles. Added an interception, a tackle for loss and a pass defensed. * vs. HOU (11/1) Posted a career-high 15 tackles and added a QB hit. * at JAX (11/22) Posted an interception. Added four solo tackles and a pass defensed. * at KC (12/13) Registered Buffalo’s fourth interception of the game on the final play of the game. Established a new career single-season high with four interceptions in 2009. Added five tackles including one tackle for loss, a quarterback hit, and a pass defensed. * Voted as a special teams captain prior to the season…recorded a half-sack and a fumble recovery at NE (11/9). * Shared a sack of Patriots QB Matt Cassel with DT Marcus Stroud at NE (11/9)… play marked his first career participation in a sack… also recovered the fumble forced by Stroud on the same play, marking his second career FR. * Had season-high four tackles, including one for a loss of five yards, a sack, and recovered a fumble at KC (11/23), starting in place of an injured Donte Whitner. * Spent the first 15 games of the season on the practice squad. Promoted to the 53-man roster for the final game and was inactive at Bal. (12/31). Three-year starter who overcame injury problems earlier in his career to become the Arkansas' top possession-type receiver… Finished career with at least one reception in 38 of his final 40 games, including all of the 2003 season… Only the 16th player in school history to gain over 1,000 yards receiving in a career… In 44 games, he hauled in 144 passes for 2,151 yards (14.9 average) and 16 touchdowns … Led team in receiving for second-straight year in 2003 with 50 receptions for 900 yards (18.0 average) and six touchdowns… Had four 100-yard receiving games in 2003, including a career-high 172 yards on nine receptions and a touchdown in team's 71-63 overtime win over Kentucky … Led the team with 49 catches for 626 yards and a career-high seven touchdowns in 2002, starting 11 of 14 games…Graduated with a degree in business management. A two-time all-state receiver and was an honorable mention All-America as a senior at Tilghman (Paducah, KY) High School … made 81 catches for 1,723 yards and 24 touchdowns during his career … played in the Kentucky-Tennessee All-Star Game … finalist for the Kentucky Male Athlete of the Year award … All-State in basketball as well … also lettered in baseball and track … Full name: George Eugene Wilson, Jr. … a member of the 2001-02 and 2002-03 Lon Farrell Academic Honor Rolls … involved in Fayetteville’s community outreach project, spending his spare time speaking and reading at elementary schools… recently made his acting debut, appearing in Mary J. Blige’s music video Hood Love as the lead male and Blige’s love interest. George is one of the most active Buffalo Bills in the community. George is actively involved in the “Play 60” Challenge encouraging physical activity among children for at least 60 minutes every day. As an active member of the Buffalo Bills “Play 60” Challenge, George helped to introduce the program in a kickoff celebration for over 2,500 students in the Buffalo Public Schools. At the assembly he participated in a “Play 60” themed trivia show and also shared health and fitness tips with the group of 3rd – 6th grade students. George is one of four players featured on trading cards used in the “Play 60” Challenge. The trading cards include health and fitness tips from players encouraging kids to stay active as a part of the Play 60 program. George was chosen as the 2009 winner of the Buffalo Bills/NFL Walter Payton Man of the Year award, as voted on by selected members of the Western New York Community. The award was given for a combination of his excellent play on the field and his tremendous off the field contributions to the community. George also participated in the 2009 Community Ticket Donation Program by donating 20 season tickets to the Buffalo Public Schools. Over 200 people were part of George’s Jungle and attended Buffalo Bills home games where they were also treated to food and beverage coupons compliments of George. In 2009, the “That’s Life” speaker series sponsored by Xerox was created with former Buffalo Bills teammate Brad Butler and George which made weekly visits to Buffalo Public schools to speak with students about reaching their goals and making the most of their opportunities. The 2010 “That’s Life” Program features George and a group of 15 high school boys from a local community center breaking down life skills over a 6 week time period. George has helped these students learn the importance of staying away from gangs to preparation for college. George even helped the young men open their first checking accounts. George along with teammate Trent Edwards, served as the spokespeople for the 2009 Buffalo Bills and American Red Cross Blood Drive at Ralph Wilson Stadium encouraging fans to donate blood by filming a PSA, appearing in print materials promoting the Blood Drive, and volunteering at the event. George and Trent will be spokespeople again for the 2010 Buffalo Bills and American Red Cross Blood Drive as well. George has also been involved with a number of different community programs including the Extreme Makeover: Home Edition and Women and Children’s Hospital of Buffalo’s Cinqo-De-Mayo Party. George also finds time to give back to his hometown of Paducah, Kentucky by holding a free youth football camp. George also just recently founded the George Wilson S.A.F.E.T.Y. Foundation. View the full website biography of George Wilson.